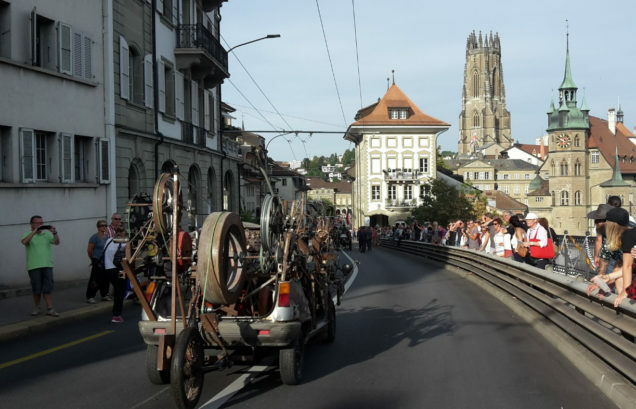 On Saturday September 3rd, the Swiss honored Jean Tinguely’s memory with a brillant and loud procession of backfiring motors on Fribourg streets. One hundred vintage vehicles paraded along with tanks, groups of children and “guggenmusik”, the typical incoherent music played during carnaval parades. The festival was in full swing throughout the afternoon, attracting about 10,000 people under a bright sunshine. Race cars and classic cars alike rolled down the streets, reflecting Tinguely’s love for movement and speed. 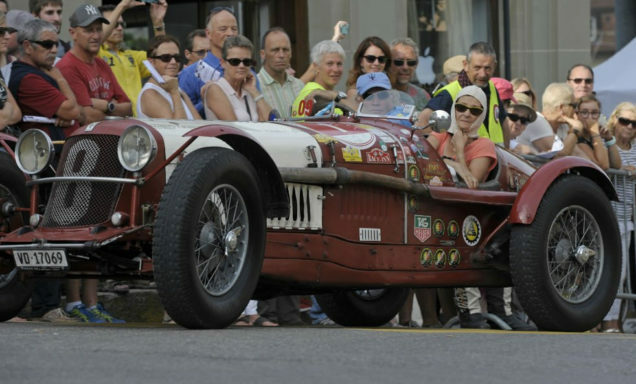 This “Grand Prix Tinguely”, as City organizers baptized this hommage event, also illustrated the friendship that united the sculptor to the racing driver Jo Siffert. 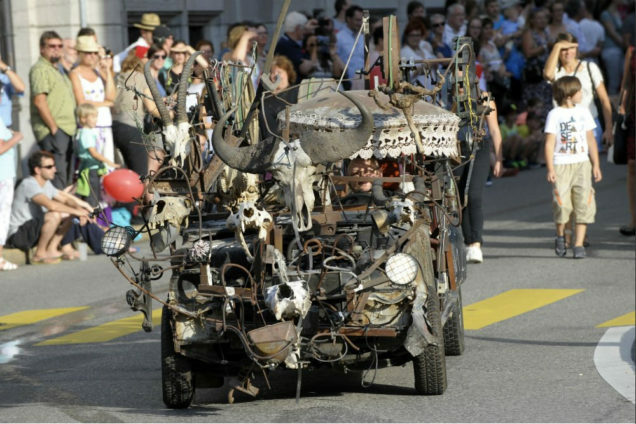 The highlight of the parade was the appearance of Le Safari de la Mort Moscovite, an itinerant work of Tinguely realized in 1989. The Tinguely Museum in Basel lent the piece for the occasion. René Progin, sculptor and long-time friend of Jean Tinguely took part in organizing the event and Niki de Saint Phalle’s grand-daughter participated in the festivities. Other events, like the inauguration of a Tinguely alley in Neyruz, exhibitions, plays and shows, are planned until the end of year to honor the Swiss sculptor. To find out more about them, consult the website : http://www.tinguely2016.ch/ and the official program.